Oftentimes, these goal-minded approaches can lead us back into the same loop we have been trying to untie since childhood. But what if the need is not about being good enough” or to thinking you have to be like another. What if the need is to fully step into your authentic self? I believe our personal work is to express who we are, whoever that might be, or might be becoming, and let a non-judging belief embody us and to have patience in this process. While awaiting that nebulous breakthrough there is also something else to allow. To allow ourselves time to explore who we really are. Maybe you don’t know yet. Maybe you haven’t let him or her out. In the effort to be good enough we often miss the journey of who we could be now. Are you willing to get intimate and sensual with the mossy-edged shadow of your unexpressed self? Do you dare to release the quirky, wild and wonderful being that could be just beneath a protective shield that has hidden you from view? In each of those moments when you would doubt or criticize, what if you stopped and asked, what can I do to change this situation, what can I let go or forgive, what would make me feel better now? The answer will likely be different from asking, what is wrong with me? This is how to be well-lived and well-loved – through the journey of becoming. Be gone pain. Be gone shame. Be gone hiding. When you’re always trying to be good enough or perfect – it gets rather boring after a while. There is something much more exciting: You. 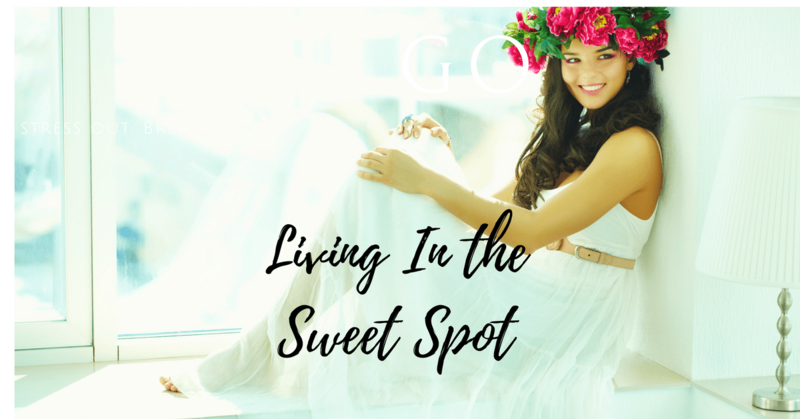 When you can discover how to belong to yourself even when you mess up or things don’t go your way, you get another chance to…..
Live from the sweet spot! FREE Fa cebook Group for Big Dreamin’ Women! Need help finding your personal strengths, passion and value This will help.